FACT: 2 of Taiwan's Submarines Are from World War II. And Replacing Them Won't Be Easy. Taipei would like to acquire newer submarines, but it is confronted with a series of major obstacles. Taiwan’s defense planners have a uniquely unenviable mission—the defacto island state of twenty-three million somehow seeks to deter an invasion from mainland China, a rising superpower only a hundred miles away. Realistically, the breakaway Republic of China cannot hope to prevail in a knockdown-dragout fight with Beijing. However, Taipei’s gambit is to make such a battle so potentially costly that Beijing will not be tempted to abandon its strategy of seeking reunification through peaceful means. Submarines could potentially prove a useful conventional deterrence to attack by interdicting the waters around Taiwan from amphibious landing ships and harrying the PLA Navy’s numerically superior naval forces, while remaining submerged at sea to avoid attacks by China’s land-, sea- and air-launched anti-ship missiles. However, the Republic of China Navy (ROCN) has only four submarines. Two of these, the Hao Si and Hai Pao, are American Tench-class boats that date back to the end of World War II. The oldest submarines still in service anywhere on the world, they are used only for training purposes. The other two are Dutch-built 2,660-ton Zwaardvis (“Swordfish”)-class diesel submarines, acquired in the early 1980s and renamed the Hai Lung and Hai Hu (“Sea Dragon” and “Sea Tiger”). Though dated, they were upgraded in 2008 to fire UGM-84 Harpoon anti-ship or ground attack missiles, giving Taiwan a limited submarine ground attack capability. Taiwan had planned to purchase two to five more Zwaardvis boats, but Chinese pressure on Amsterdam forestalled the deal. Taiwan’s principally ally, the United States, is willing to assist in building submarines. Indeed, in April 2018 the State Department approved a marketing license for submarine parts to Taiwan, including a Combat Management System. Taiwan already possesses licenses for Mark 48 torpedoes and Harpoon missiles. However, the United States has not produced any conventionally powered submarines since the Barbel-class in the 1950s—and conventional propulsion is far more affordable and appropriate to Taiwan’s need for a short-range coastal defense submarine. Reportedly, the Pentagon is also weary that technology transferred to Taiwan could make its way to the mainland. In Europe, there are numerous conventional submarine builders—but most appear unwilling to sell to Taiwan because of the likely political retaliation from Beijing, which appreciates the strategic complications a modernized Taiwanese submarine force could pose. Chinese pressure sabotaged a 2001 initiative under the George W. Bush administration to facilitate the purchase of European-built submarines for Taiwan. Therefore, late in 2015 Taiwan declared it would seek to build four to eight Indigenously Designed Submarines. This initiative gained additional steam with the 2016 election of President Tsai Ing-wen, who favors maintaining Taiwanese independence from China. 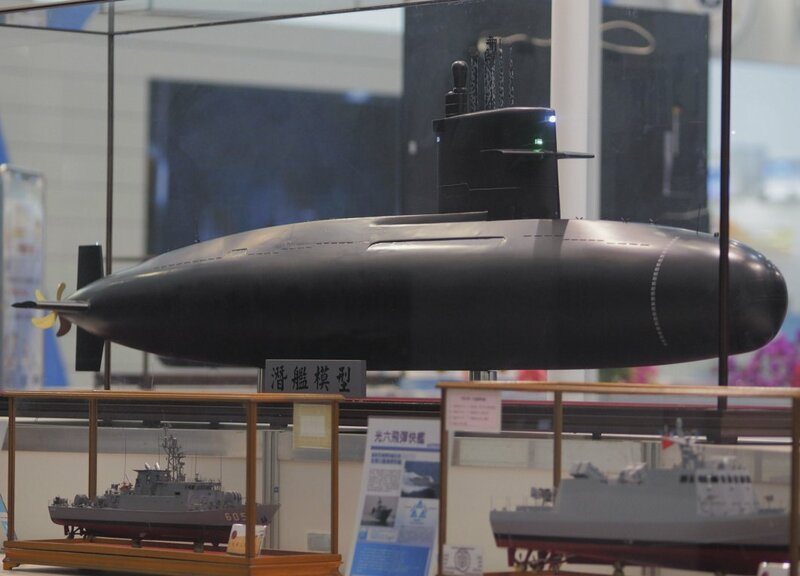 At a maritime defense exposition in 2016, the government showed off a model (picture here) for a 1,500-ton Qianlong project submarine with a hydrodynamic teardrop-shaped hull. A prototype pressure hull had reportedly been built out of Taiwanese HSL-80 high-strength alloy steel by the China Shipbuilding Corporation (CSBC). Supposedly the Qianlongs could enter service by 2026, with the first four estimated to cost $5 billion—twice the per unit price of contemporary conventional submarines like the German Type 212. But Taiwan has never built submarines before and does not possess the expertise. In 2015, Taiwanese engineers dismantled one of the World War II-era submarines to figure out how it works! The government apparently hopes to slap together component acquired from abroad. The United States, for example, may lack a diesel propulsion system, but could provide a Combat Management System (the hardware and software which integrates sensors, weapons and controls for the crew), sonar, weapons and other key technologies. Taiwan may wish to secure a state-of-the-art Air Independent Propulsion (AIP) system, which allow a conventional submarine to very quietly operate submerged for weeks instead of having to surface or snorkel every few days. China, France, Germany, Japan and Sweden all have deployed AIP-powered submarines, and Spain is close to doing so despite setbacks. However, the European countries are weary of inciting Beijing’s wrath, though the Dutch RH Marine did recently agree to overhaul Taiwan’s Zwaardvis-class submarines in 2022. In Asia and the Pacific, Australia, India, Japan and South Korea are all submarine builders and have a strategic interest in reinforcing Taiwan’s naval capabilities. However, they are also more directly exposed to Chinese diplomatic and economic retaliation, which likely forestalls South Korean involvement. Of the others, Japan is the most advanced submarine builder of the three. It produces advanced Soryu-class submarines using Stirling AIP, and is set to upgrades these with new lithium-ion batteries that could substantially improve performance. However, Tokyo has been reticent to transfer submarine technology abroad. Though Australia and India build submarines domestically, they depend upon largely foreign designs. A Twenty-First Century Barbel-class Submarine? In July 2018, Taiwan’s Liberty Times reported that six companies had submitted bids to assist the Taiwanese submarine program. These included manufactures from India, Japan (retired engineers from Mitsubishi and Kawasaki Heavy Industries), and two companies each from the United States and Europe that presumably prefer to remain anonymous for now. Reportedly the United States facilitated the contracting of the Japanese engineers. One of the proposals will be selected in 2019 and supposedly a design blueprint will be finalized in 2020. Coates argues that several factors suggest Taiwan is seeking to build a 21st-century version of the Barbel-class submarine, which pioneered the teardrop-shaped hull featured in Qianlong model. Taiwan’s Dutch Swaardvis-class submarines are based upon the Barbel, and Japan also built Uzushio (Whirlpool)-class submarines inspired by that design. Thus Dutch, Japanese and American ship builders would all possess some familiarity with a Barbel-style design—and the ROCN would have experience operating the type. A modernized Barbel would still entail major improvements to sensors, command systems, propulsion, quieting of machinery and so forth. However, given the lack of funding from Taipei, it remains questionable whether submarines are truly a practical solution to Taiwan’s security needs. Anti-ship missiles mounted in coastal batteries or small fast attack craft could offer a more cost-effective and survivable means of defending Taiwanese waters. Submarines, conversely, could be hunted down by Beijing’s vastly larger submarine force, or destroyed in port by a surprise attack by PLA missile. RIP: America's Lethal F-117 Stealth Fighters?